Background: Nutrients and bioactive compounds present in the foods are known to interact with genes to alter their expression, which consequently results in several chronic and diet-associated disease conditions. Methods: In this review article, we did a literature survey to highlight the known effects of bioactive compounds/nutrients on key metabolic pathways or genes, the current “omics” based advancements in human nutrition research, the underlying ethical issues, and future challenges towards diet personalization. The articles with transcriptomics, proteomics, metabolomics and system biology approaches for analysis and validation of bioactive compounds for their interactions with genes were included in this review. Various opportunities and challenges based on advancements and outcomes of this science were explored with special emphasis on ethical considerations. Results: Ever-increasing impetus to nutrigenomics has given tremendous scope and opportunities to formulate personalized nutrition and tailor-made diets. Ayurnutrigenomics, an ayurveda-based approach has also received considerable attention in recent times. The tables and figures in the article provide an evidence for specific effects of nutrients on targeted genes and their metabolic pathways. Both positive and negative correlation was observed among dietary constituents and associated diseases. PPAR was found to be centric for effect of bioactive compounds on fatty acid metabolism. 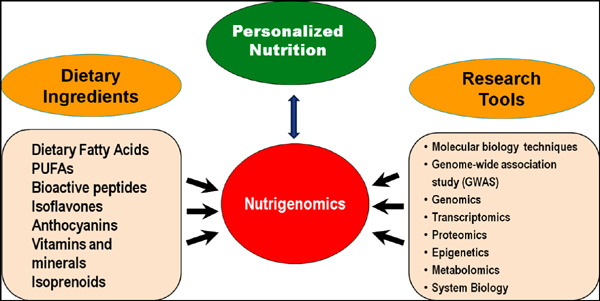 Conclusion: With significant progress in recent decade and tremendous scope to make the diet personalized, the nutrigenomics approach can be implemented efficiently after integrated use of omics techniques, developing cost effective related analytical methods and considering various ethical issues. Gene-diet interactions, metabolomics, nutrient-gene, nutrigenomics, personalized nutrition, transcriptomics.